Italy has always been a country much appreciated by the Japanese for landscapes, culture and arts. Important places or monuments have appeared both in manga and in anime, to mention: some settings of Porco Rosso by Miyazaki or the last series of Lupin, but still few are the series entirely set in this country. 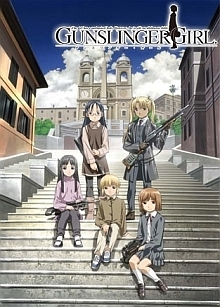 One of those that I consider artistically more relevant is Gunslinger Girl, started as a manga in 2002 and than transposed in two animated series. In a contemporary but alternative version of Italy, the country is plagued by terrorist attacks from an independentist front called "The Movement of the 5 Republics" (with veiled reference to some political ideas of the real Lega Nord) that organizes terrorist attacks to achieve its goals . For this reason the Government creates a special police department called "Social Welfare Agency" in which, in a particular unit, girls saved from disabling diseases or situations of abuse and violence, are turned into cyborgs. Each of them, after a conditioning where her memory is erased, is entrusted to an agent called "fratello" (in english “brother”) who becomes his working partner. The story tells about adventures of the various pairs of agents in the fight against crime and the emotional fragility of the girls/cyborgs who, despite the conditioning, maintain their human souls. Gunslinger Girl is an intense reading, with many levels of lecture, but very exciting. It starts from political themes with references to terrorism, Red Brigades, government intrigues and characters inspired by figures of Italian politics (including Bossi and Berlusconi) with police stories and corruption. The action is not lacking with the "puppets", so are called the cyborg girls, always on the way in high-voltage situations. Then there is the more introspective side in the relationship between girls and their "brothers" who run them according to their vision and reflect about important social issues such as violence against women and criminality. The stroke of Yu Aida is fine and essential, even during the fight and combat scenes remains extremely clean with a care of the backgrounds and locations. 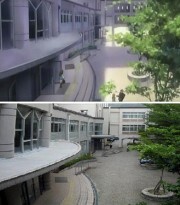 For Italian readers is a pleasure to be able to recognize places and situations and see how they have been reported in the manga. The series is complete and counts 15 volumes (the Italian publishing history is incomplete and flagellate) and it’s english localized thanks to ADV Manga. Those who are looking for an exciting and non-trivial reading can find in Gunslinger Girl a good story not to be missed.